The new Lamborghini Aventador SVR has smashed the production car lap record at the Nürburgring, previously set by the Porsche 911 GT3 RS. Lamborghini launch their new SVR next month (which stands for SuperVeloce Jota, in case you didn’t know! ), but we still don’t know all the technical ins and outs. We have, however, heard through the grapevine that it will produce 759bhp and up to 531lb ft from a reworked 6.5 litre V12 engine – 20bhp more than the Aventador SV. What was the lap time? A trouser-dropping 6min 44.97 seconds gave the SVR a sweet 2.27 second victory over the GT3’s time. 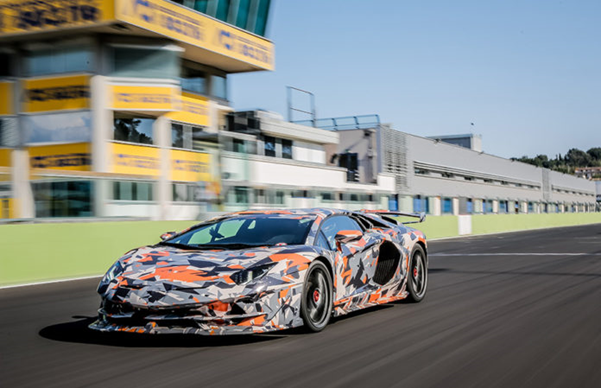 Lamborghini’s approach to the aerodynamics is largely thought to be the deciding factor in the successful lap. They claim it has “the best aerodynamic efficiency” and a class-leading power-to-weight ratio. Physically, you can see how this car is similar to the Huracán Performante. Learning from the ALA adaptive aerodynamics, the SVR has a reworked rear wing, and also is sporting a very distinctive front wing. The dual-pipe exhaust system, also used on the Performante, keeps exhaust gases away from aerodynamically sensitive areas.